I finally grabbed a few hours today to paint! As much as I need to wrap up some painting for others, I really needed to do something for myself (fun, no pressure, etc.) to de-stress a bit. Plus, I really didn't have that much time, so it was speed painting rather than nice detailed painting. 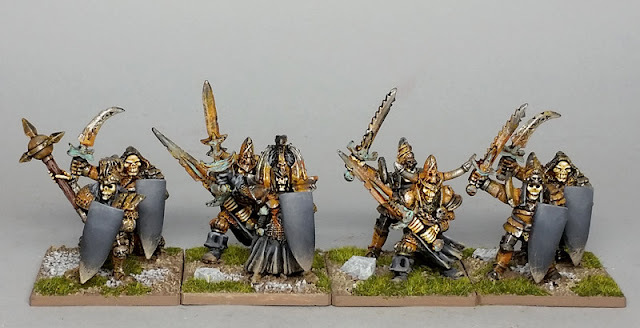 I painted up a small unit of skeleton guard (old 4th ed. Citadel wights.) Not as good looking or dynamic as the Warmachine Bane Thralls I used on my first unit of skeleton guard, but they have a certain retro-charm. Plus I got them in a trade for some other old figures, which is more agreeable with my limited gaming finances. I wanted to use the old plastic high elf kite/heater (something in-between?) shields, but only have a few. I tried making my own by cutting thin polystyrene sheet to shape, heating it up a bit, then bending it around a wooden dowel. After they cooled, I did a bit of sanding. They're not perfect, but the look close enough on these figures. 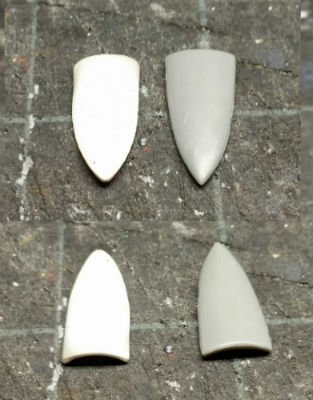 Below is a photo of my first test-piece, before I sanded it, shown next to an original GW plastic one. They look great! I've got a unit of these painted up as "living statues" and based in the same manner - two per base. Your shield manufacture process worked a treat too. Living statues -- are you doing the Army of the Cairns? I was just reviewing those old articles for inspiration! wow, great work on that shield! Considering the rarity of some of those shapes, replacing them is a good idea. Thanks. Luckily, this shape is easier to cut than some of the others -- though the curved cross-section was an added hassle. Doing a few was OK, but I'm not sure I'm up for putting these into mass production for the small pile of old high elves that also need shields.